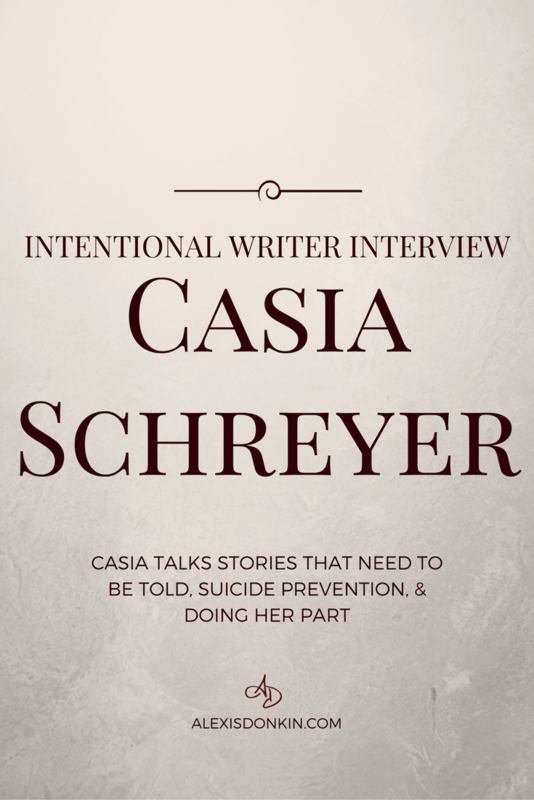 How does a creative person infuse love into their work? Today I want to talk about what happens when we let fear guide our creativity, how to remove fear and replace it with loving processes and impacts. Intention is important to everything we do. This is especially true for creatives – those of us who make new things, including new ideas. When we make new things, we change the world around us (sometimes in unexpected ways). I’ve written a lot about the intentionality behind creativity – the importance of considering how our creations impact the world, because nothing is born in a vacuum. Our creations – whether they are businesses, inventions, or paintings – send ripples through life, often long after our deaths. Just think of the poor guy who invented the Keurig machine. Really. That guy HATES his invention because of what it does to the environment. He DID. NOT. THINK. IT. THROUGH. Or maybe he did, but he was driven by a motivating force like fear. Oh no! I could have X problem! I need this new thing to solve it! I need to produce Y widget or someone else will! I need to do Z because I need more money! These thoughts are all based out of fear and while they may get you something in the short term, but in the long term things may get worse. This is because they do not address the root issue, which is the fear itself. The fear is the problem – not inconvenience, lack of time, or scarcity of money. Fear is the issue, and so this is where our work begins. When an action is based out of fear, guess what? The results turn…well… twisted. Think of a person who is afraid of never having enough. Such a person may act based on having more and more. They may hoard things, feeling like they cannot let go of anything. As a result, their life is full of clutter, and some, if not all areas of their life, become stagnant. They are never satisfied, and so can never experience joy or peace. That is one option. The other is someone who is so afraid of not having enough, they actually focus on it so hard they create that lack in their life. This is where they reject having good things and actively create lack on the subconscious level. In every fear these are possibilities – extreme responses to the thing that is feared, both being incredibly unhealthy. Both responses cause other issues that impact multiple areas of life while never addressing the underlying issue – the fear. We always want to create based in something else – love. When we create based out of love, beautiful things happen. To do this however, we need to address our fears first. Fears have served well in the past by keeping us safe or feeling secure. Culture says we need to be afraid. Uncover what your patterns are. This can be done with journaling, assessments, counseling, talking to friends, or maybe you’re already well aware of them! Once you know what your fear patterns are, clear them out. This is done by forgiving yourself for repeating and accepting them, forgiving others responsible for passing them on, and practice decluttering (physically, emotionally, and spiritually). Finally, replace the old patterns with new ones! This is done through being more fully present (start this with a gratitude practice), affirmations, and taking small actions based in love. Once you’ve addressed your fear patterns, the remaining blocks are easy to remove. You will realize as you begin working on new thoughts and beliefs based in love will serve you more than your fears did. Suddenly cultural messages of fear will sound thin and even silly. You will see the truth that fear as a route of self-sabotage and injury, rather than salvation. If fear doesn’t motivate us in business, what else is there? These statements are really unhelpful because it’s never exactly clear what these mean. How do they play out? What do we do with this? How do we even find out what we love? The list of questions goes on and on. This is why I want to clear things up by sharing two ways to consider love in business or work: process and impact. An inventor loves to tinker. A writer loves crafting sentences. Painters love playing with colors and texture on surface. The joy of work, the love, is in the work itself. The labor is the love. My husband is a classic example of this – he LOVES tinkering. He LOVES problem-solving. Whenever he touches an engine, appliance, or computer, he gains extreme satisfaction from not only making the thing work, but work better than it did before. His love is the labor. For my husband, the love of the process was clear. He’s been doing this in one form or another since infancy. This is a common experience – loving the process of work is often obvious. We are drawn to the process of creating in one way or another and it shows up over and over again throughout life. These are desirable results. The path to achieving those results may or may not involve love (or passion). It is the impact itself that matters. While I enjoy writing, playing with ideas, and creating, I also LOVE impact. I love seeing results in someone’s life. 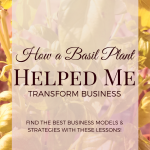 I was talking with a classmate from art school, and explained how I helped one client get several pieces of writing accepted the day after a session, and another have several viral blog posts days after a session. My clients see positive results and that is something I love. Here’s the thing about this whole experiment: love needs to be in both the process AND the impact. Love can’t be just in the process, otherwise we end up making things like Keurig machines and polluting the environment. Love can’t just be in the impact, otherwise we end up burnt out and hating our daily experience even as we work toward a better tomorrow. In order to honor ourselves and live the love lifestyle, we need both love of process and impact in our work. So how, as creatives, do we make that happen? We’re at an advantage in this because of how creativity functions. We make stuff. We bring NEW things into being. For most creatives, it is IMPOSSIBLE not to create. This is something that is beyond love, and part of our essence. It’s central to who we are as people. We create. It could be argued, if anything, to create is an act of self-love, honoring who we are as people. So we’ve got the process thing down. We love the process, no question, but what about the impact? This is where we need to bring intention into our creating. This is where we must focus on the kind of impact we want to have in the world, based on love, and then follow the creative process to get there. Am I seeking the highest good for all involved? If not, the impact is not right. If yes, then it is. It’s that simple. 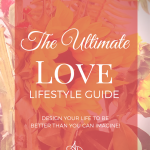 Love needs to be in every phase of work – every phase of creativity – if we want to intentionally life the love lifestyle. It benefits us by allowing us to honor ourselves, practice self-care, as well as love for others. 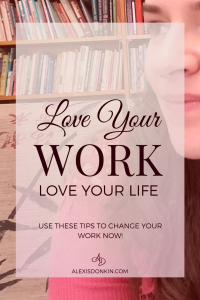 It’s a win-win-win to love your work. 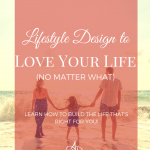 Want to live the love lifestyle but not sure where to start? Find out how I can help you starting today! Wow, a powerful piece of writing on such a key topic. I loved what you say about making sure we are always aligned with love. Thank you.